What is a PEG: PEG stands for percutaneous endoscopic gastrostomy shortened to PEG. What is it used for: It is used for different kind of medical conditions where a person may not be able to eat or swallow for a short or long term period of time. Why is it used: A PEG is used to help the person using it receive essential vitamins and nutrients that you may not get from not eating or because you can’t eat due to a medical condition. Where a PEG is placed: A PEG can be used to in 2 different ways. For short term, a tube can be put down your nose and into your stomach which is put there by a doctor. 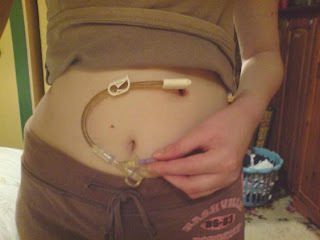 For long term, it can be a tube put directly into your stomach through your stomach wall which is put there by surgery. I have had the nose tube in 2003 for a month & had it successfully taken out. I now have the PEG in my stomach and still eat with my mouthh too. How long will I have it? It can depend on the person and the situation; a doctor would prefer you to have it as short a time as possible. I have had mine for a 16 months and it has done me the world of good what with my weight although I don’t know how long I will have it in for. How am I fed: I can still eat by mouth and I get fed 2- 3 nights a week at the moment by a pump that pumps the liquid food in to my stomach through my PEG. Does it hurt? The nose PEG can be uncomfortable when you have it put down your nose but after it’s in, you hardly feel it. The stomach PEG can be a little trickier as it is done by an operation so you can feel a bit of discomfort in your PEG area afterwards and because it’s an open wound, you can be vulnerable to little infections in the PEG area which can be a bit sore which are rare if you look after it. You are also aware that it’s a tube coming out of your stomach so if it catches on something, it can hurt. I always tuck mine in whatever trousers I have on! My feeding over night is ok too because I don’t feel anything. Why was I give the PEG: My doctor suggested giving me a PEG because I wasn’t getting enough nutrition and vitamins because I’m a fussy eater due to the way I grew up and ate easier foods due to my mitochondrial condition and the possibility that it might help me put some weight on as at the time I was 6 stone. I’m now 8 stone. How do I look after it: I look after it by flushing the PEG with sterile water with syringes I get from hospital every morning and night. I also flush my PEG before I put my feed pump on. I also keep the area of the PEG clean so I don’t get infections. What the PEG done for me: it has helped me gain 2 stone of weight and look much better in myself than I did (I’m now 8 stone)and it helped stop my occurring ear infection that I had for years. There are times when I feel like I’m a bit of a failure because of the way I am now. I know my family put up with a lot with me and how my OCD is and that makes me feel bad about myself because I just can’t snap out of it although I really wish I could. I see friends or my brother going to university and I can’t help but think “did I miss out on that?” “Was I put in the lower classes at school because I was deaf or because I wasn’t smart enough to be in the higher classes?” or “What are all my qualifications from school and college for if I can’t cope with a job?” I love my volunteering but sometimes I wonder what it would be like to earn my own money and work my way up in something I really want to do, but I know at this point in time, I could never cope with the responsibility of a part or full -time job because I’m so tired and I have my hospital appointments. Most of my friends that DO work wish they had my life because I don’t work, have lie ins and basically have all the time in the world to do what I want to do but where does that get you in life? Nowhere! Today, on a fine sunny autumn day, I went in the garden to feel the warm sun on my face and after sitting on the swing chair for a bit, I decided on the spot that I would go for a walk! (Believe me, it doesn’t happen often!!!)) 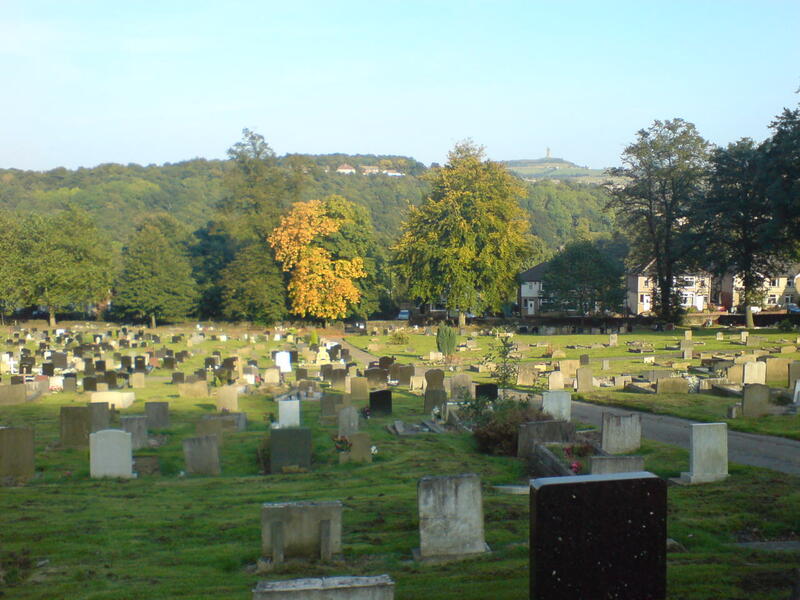 There’s a cemetery across the road from us and it’s got a steep path upwards so when you get to the top, there’s a great view and it’s really peaceful. There was hardly a cloud in the sky and I decided to take a picture of the view and of Castle Hill which is a famous landmark in the town I live in. Good exercise going up the steep hill too for me as it works my legs! I took a seat for a bit and took in the view for a few minutes before going back home. It may sound weird that I like walking around a cemetery but I’ve lived opposite it since I was 2 and I think nothing of it, I think it looks all pretty sometimes with all the flowers and the trinkets they have hanging on the trees. I grew up with my parents telling me the dead can’t hurt you, just the living but I would never walk up there at night!!! Death is never a happy subject but a cemetery is a place where you can reflect on memories, a peaceful place. I also found lots of conkers on the way to the cemetery too!! I have had the best day, what with volunteering at the school, which may only be a short bus ride away from where i live but even though its baby steps, it’s making me more confident and independent for the first time since I found out I had my mitochondrial condition in 2004. I’ve been helping out in the classes again and gaining social interaction with both adults and children. I am really looking forward to the Arts & crafts week that we have coming up which will be lots of fun! I also have my first part of my story on The Deaf Blog, and feeling ultra confident and super happy with my life at the moment as it is now. I have my brilliant family&friends. I can’t help wonder if there’s a storm brewing though what with my OCD because it’s kind of unpredictable! I don’t know when my cognitive behavioral therapy begins as there’s a waiting list but I’m NOT looking forward to it! My confidence can be good most of the time till it comes to the OCD which when something happens, it kind of ruins the good stuff that happened that day! So I’m really going to try and beat this OCD although I know it will be distressing and upsetting! I hope I can maybe have a holiday next year too since I haven’t been on a real holiday with my family since I got my PEG in may 2007 because of the amount of stuff we have to bring with us like the pump and the feed etc. I have only had weekend getaways which I still love like trips to Blackpool but theres nothing like going abroad! Hopefully I will be getting closer to the point of getting my PEG out for good soon but thats down to the docs!!! Oh and I also changed the blog around a bit so it looks a bit better now. I will hopefully also get a better picture for the blog!! Understanding me is not easy! I have many people ask me various questions about my life when I meet new people and why I can’t do certain stuff. Maybe I don’t explain it well enough, I don’t know but when I talk to new people I go through the same stuff over and over again such as why I need to sleep a lot and why I don’t go out as much or have a job and basically why I am how I am! I can sometimes send them this blog but not many people have time to read it all my posts or basically skim through it and I can understand that if they are busy people but if they don’t read the blog, I wonder why do they want to ask me Qs about it if they have this blog with everything on it! I have a combination of 5 things all at once and it gets incredibly annoying to be like this & coping with it. I can get upset about it all because I feel other people and my friends are doing what they want with their lives and I can understand that because they are healthy, why should’nt they? then i think what i am doing with MY life because I can’t even summon myself to go in the garden because of a dustbin?? or worry about going out in case I need to use the loo (because i need a disabled toliet with bars that help me get up off the toliet) Every couple of weeks or months, me and my family go through the same thing with me where I get upset about it all and I’m feeling I’m not achieving anything in my life because of those 5 combinations of things. I have a lot of new people call me lazy when I tell them that I need a lot of sleep and etc, I try and laugh it off but sometimes it can hurt my feelings the way some new people say it. I do hate being at home ALL the time which is why I volunteer but it doesn’t help when some new people saying “you need to get out more” because it’s really not as easy as that!!! 2. Cochlear Implants: have had two CI’s separately because I went profoundly deaf at the age of 8 because of Multiple mitochondrial DNA deletions. I now have just one after losing one to a bad ear infection. 3. Raynaud’s syndrome: I get cold more easily than usual so I like to be nice & warm! 4. OCD (obsessive compulsive disorder) and anxiety attacks: I have suffered from both since I was in hopsital in 2003 when I had a routine op and it went downhill after ending up staying in hospital for a month/and worry a lot. I hate it when this happens but i have good and bad days as does anyone. 5. PEG (Percutaneous endoscopic gastrostomy): I was given this in 2007 when I had trouble putting on weight due to Multiple mitochondrial DNA deletionsand get fed 3 nights a week at present. It also ended in me spending 5 weeks on life support due to contracting Pneumonia & Septicaemia. Due to the PEG I have gone from 5 stone to a healthier, curvy 8 stone. (size 8 to size 12-14) and feel more self confident with my body now. Now all of these are what I am coping with at this one time and you can’t expect me not to be a bit stressed out or depressed or even a bit CRAZY from time to time!!! This is all why I don’t have a job or have trouble with some things. I don’t expect people to change their ways for me. I expect them to understand where I’m coming from and respect WHY I’m like how I am! I have my ways that I always have been like staying in with the family and don’t like to get drunk which is nothing to do with the combinations. I am just simply like that and like to sit in my chair talk to friends online, or watch a TV/DVD with a cuppa. Take it or leave it, that’s me! My first day volunteering at my junior school went well! I had to brave a little steep walk up the path to the school which left me out of breath! At least it’s some kind of excercise I am getting! At the school, I helped a little boy who has a vision impairment and my job was to help him do some writing work on the computer then for my next job was to help in the classroom, I handed things out to the children and listened to some of the children read their books! It was a job listening to them as it was a busy classroom with lots of noise but I managed to keep on what I was doing! One of the children had a very quiet voice! It was very enjoyable and I got on with the teachers well! I don’t know what I was so nervous about but I’m a born worrier anyway! I’m sure I will enjoy more time volunteering at the school! I’m sure I will gain a lot of social and self-confidence there too. I summoned up the courage to ask about things I weren’t sure about and even corrected a teacher when she got my name wrong over a busy classroom! I learnt that I’m more confident than I think I am but don’t often show it! I hope that things will go just as well as time goes on and my confidence will continue to be on the up! It certainly makes it easier that it is my old junior school because it’s familiar ground and knowing some people who work there. A bad update is I’ve been a bit sore on my PEG site on my tummy and I could hardly move without it hurting and it’s like a sharp feeling as if u have a piece of glass in there so it’s not been nice feeling like that! It’s all better now since my mum put some cream and a bandage between my stomach and the little piece that’s stops it going inside my stomach! MUCH relief! I had both my appointment at hospital and interview at my old junior school today (for volunteering see post Moving on) I wasn’t keen on the hospital appointment, but the interview at the school was good. It was great to see my old junior school and how everything’s changed since I left. It has certainly improved since I was there and lots of new teachers! I start next week to see how I get on! Hopefully I can gain a bit of self confidence in myself rather than asking people what I have to do. I’ve always been a follower of people so to move into being my own boss in my head will be different but it should help my self-confidence. I’m going to be helping the kids with their work so hopefully I can follow the lessons!!! It’s been a while since I’ve been at school learning different subjects! My mum has told me I should use my initiative and learn to do things by myself rather than wait for someone to help me! I just hope I can and don’t feel a bit lost!! The head teacher showed me around the school and told me if I miss anything in the class just ask! Also the kids were very noisy talking amongst themselves so I hope I can overcome it all and listen carefully! I think the head teacher was impressed with how I cope with my cochlear implant and my speech! I also think that I might ask If I could get a lead to connect to my laptop to my cochlear implant so I can listen to music although the problem with that is I will only be able to listen to the music directly to my cochlear implant so that means I cannot hear what is going on in the family house, like my mum shouting me for tea etc. I had a lead on my last cochlear implant but I never used it because I preferred to listen to everything really! The music, the humdrum of my house and family talking basically all the wonderful sounds you can hear with the cochlear implant!! !